Is it in the code? Apple has been sticking with a maximum capacity of 64GB for its iOS devices for some time, but a new report claims we may soon see a new model of the iPad 4 packing 128GB of storage within. 9to5Mac reported Sunday that Apple may be preparing to release a new configuration for the current iPad 4 with Retina display, which debuted in September, this time doubling the maximum storage capacity from 64GB to 128GB. According to unnamed sources, the larger capacity model will be a new SKU added to the current lineup and not a new model altogether. It will come in the same black or white colors and have Wi-Fi only or Wi-Fi + Cellular options. The report also claims the new 128GB model with Wi-Fi only will retail for US$799, while the cellular-equipped version will take it to US$929. For comparison sake, the iPad 4 currently costs between US$499-US$699 for Wi-Fi only models and US$629-US$829 for Wi-Fi + Cellular versions. Lending credence to Sunday's report is a new iOS 6.1 beta build Apple released over the weekend, which appears to contain code specifically referencing an iOS device with 128GB storage capacity. Although early reports assumed the iPhone would be the device to receive the storage bump, 9to5Mac sources claim that a beefed-up iPad bearing the code name "P101 ULTIMATE" (for Wi-Fi only) and "P103 ULTIMATE" (for Wi-Fi + Cellular) could appear in the very near future. 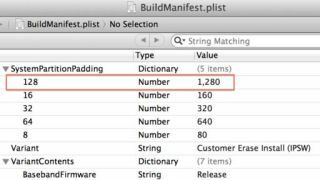 The fifth iOS 6.1 beta also isn't the first place where a 128GB storage capacity has turned up in Apple's software recently - the company's iTunes 11 software for Mac and PC released back in November also featured code referencing the same capacity. Whether a 128GB iPad is something that will see a consumer release (various reports have the iPad aimed at government or retail applications) or with subsidized pricing remains to be seen, if the device is in the works at all, that is.